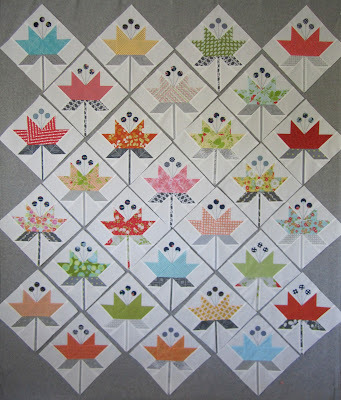 28 bloom blocks pieced, only 8 more to go! My design wall can't hold any more. Here's a close-up for you to enjoy. I've not even come close to falling out of love with this project. It's usually about this time when I'm either questioning my fabric choices or pattern decision. Nothing but happiness and fun in my sewing room. Today is the last day to leave a comment on Monday's post to be eligible to win Monique Dillard's latest book, Diamond Traditions, don't miss out! The questions answered the most frequently so far have been what is your least favorite and most favorite aspect of quilting. We need to form some teams, I need the quilters who enjoy picking out fabric and don't like cutting on my team. Isn't it funny, as a group, how we like and dislike different tasks? I love cutting the fabric and can't imagine anyone not enjoying it too! Monique is wrapping up the book tour at her blog today, click here to check it out. Your quilt is so pretty!! I love this pattern. The fabrics you used are gorgeous..
Love, love, love it. Beautiful fabrics and so cheery. It's going to be a stunning quilt when finished. It's so beautiful.... I need to make this quilt again in summer colors. This is such a happy looking quilt. Love the look of it. Can't wait to see it finished.Have a wonderful weekend. Oh my cuteness.....love, love,love these lilys and the colors are just great! This is by far a GREAT quilt and can't wait to get my pattern in the mail....yes, I am going to try this one first as the colors just are calling to me. Thanks Thelma and beautiful! Can't wait to see the finish. These are turning out so cute. Great job on fabrics. I love it!! Can't wait to see this all finished! What a fun quilt. So nice, Thelma! Have a great weekend. them are some purrtee flowers, little missy! really, really love your blocks - you can pick out fabric for me anytime! This is the absolute perfect quilt to make right now with those fabrics - end of spring and the perfect start of summer. The fabrics are so happy, who would not just fall in love all over again!! Can hardly wait until you lay this all out in order - then again, you may just change up the pattern a bit - LOL!!! I can't imagine someone not like cutting. I love straighening it, patting it, making it just right, then that first cut to clean up, then making sweet little organized piles (that's what I do). Love all my steps just right, and then fun to sit and sew and watch the magic happen. Oh my goodness - those all look fantastic. I was just considering classic reds and have some dark purples for the berries, but they don't seem to be enough contrast to really stand out. Maybe I need to interview some other choices. Decisions, decisions. Your fabric choices are as cute as can be. Love the colors and textures. You do such beautiful work. Your blocks are so "summer" with your wonderful fabric choices. It's going to be beautiful. I love these blocks and love how they have such a bright fun feel! What a difference from the original pattern! What's not to love!!!!! Love - love - love scrap quilts in any shape or form!! Oh Thelma, I will audition for the job of fabric picker outer on your team. I love that part of the process! Your blooms are lovely! Those blocks could NOT be any prettier!! Love them! Such a great variation from the pattern photo! I can't wait to see them placed with the flying geese units. I will probably have to order the pattern myself and make a small wall hanging at least - it is very inspirational! I feel like a stalker because I've commented on every post about this quilt. It is so fabulous! How are you going to group them? Love that quilt. Bright and girly. This is going to be an amazinq quilt. Love the blocks. Thelma your bloom blocks are looking beautiful! They are so colorful and bright.